An international network organisation working in solidarity with the Sahrawi people, Western Sahara Resource Watch, has swiftly reacted to reports that a subsidiary of the Libyan state oil company [Tamoil] is on the verge of investing between US $100 and $150 million in the occupied Western Sahara. 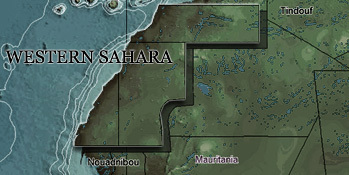 "If this is true, it would mean a serious betrayal of the Sahrawi people's legitimate struggle against occupation," Western Sahara Resource Watch protested. Tamoil Sakia, a newly established Libyan-Moroccan oil company based in Western Sahara's El Aaiun, is reported to be moving fast to invest in the petroleum sector in Western Sahara. The million-dollar investment last for two years, but Tamoil's General Manager, Salem Bayet al-Malto said upon discovery of oil, the company will double its Western Sahara investment. The activities are said to begin in 2008. Tamoil is reported to have acquired permits to explore both onshore and offshore oil and also distribute petroleum products in Western Sahara. The company is expected to start effecting the deals in 2008. "Western Sahara is under illegal and brutal occupation by Morocco," said Javier Lachica, Coordinator of Western Sahara Resource Watch. "The UN has also made it clear that further oil exploration in Western Sahara would be in violation of international law. Entering into oil exploration agreements with Morocco in Western Sahara is therefore highly unethical. It also risks strengthening the occupation, as well as prolonging the exile of the Sahrawi refugees in Algeria. The international network urged Tamoil to reconsider its involvement in the occupied state. Moroccan media reported that Tamoil Sakia consists of investors from Moroccan Sahara.